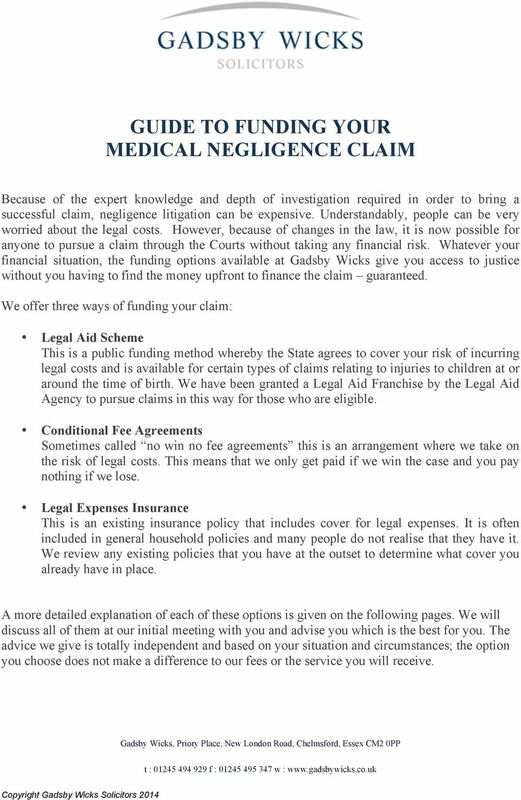 Download "GUIDE TO FUNDING YOUR MEDICAL NEGLIGENCE CLAIM"
1 GUIDE TO FUNDING YOUR MEDICAL NEGLIGENCE CLAIM Because of the expert knowledge and depth of investigation required in order to bring a successful claim, negligence litigation can be expensive. Understandably, people can be very worried about the legal costs. However, because of changes in the law, it is now possible for anyone to pursue a claim through the Courts without taking any financial risk. Whatever your financial situation, the funding options available at Gadsby Wicks give you access to justice without you having to find the money upfront to finance the claim guaranteed. 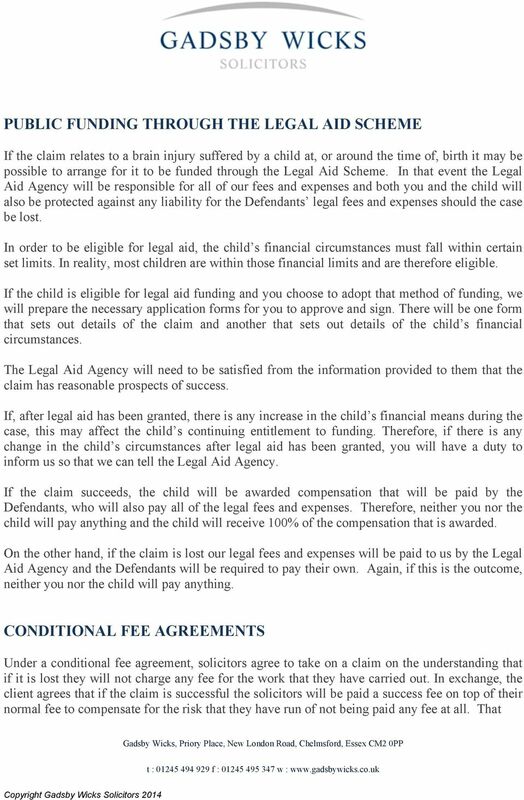 We offer three ways of funding your claim: Legal Aid Scheme This is a public funding method whereby the State agrees to cover your risk of incurring legal costs and is available for certain types of claims relating to injuries to children at or around the time of birth. We have been granted a Legal Aid Franchise by the Legal Aid Agency to pursue claims in this way for those who are eligible. Conditional Fee Agreements Sometimes called no win no fee agreements this is an arrangement where we take on the risk of legal costs. This means that we only get paid if we win the case and you pay nothing if we lose. 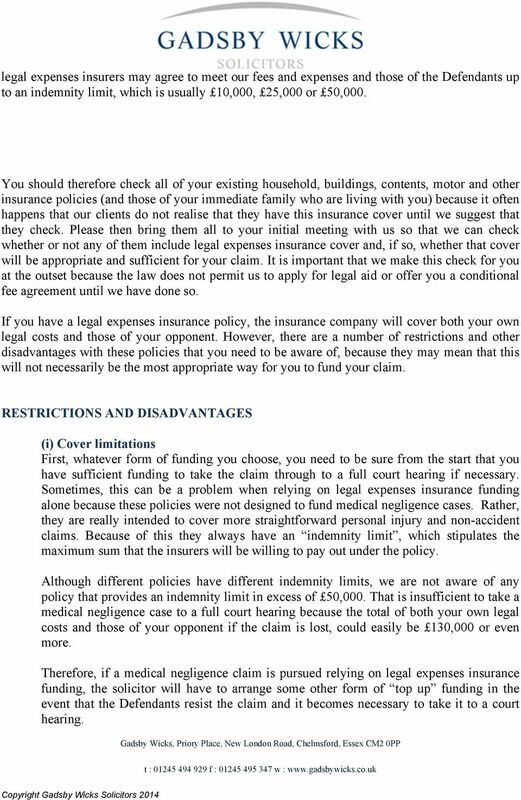 Legal Expenses Insurance This is an existing insurance policy that includes cover for legal expenses. It is often included in general household policies and many people do not realise that they have it. We review any existing policies that you have at the outset to determine what cover you already have in place. A more detailed explanation of each of these options is given on the following pages. We will discuss all of them at our initial meeting with you and advise you which is the best for you. The advice we give is totally independent and based on your situation and circumstances; the option you choose does not make a difference to our fees or the service you will receive. 3 success fee is paid by deduction from the compensation and is calculated as a percentage of the solicitors' normal fee (not as a percentage of the compensation that is awarded). The level at which it can be set is strictly controlled by government legislation. 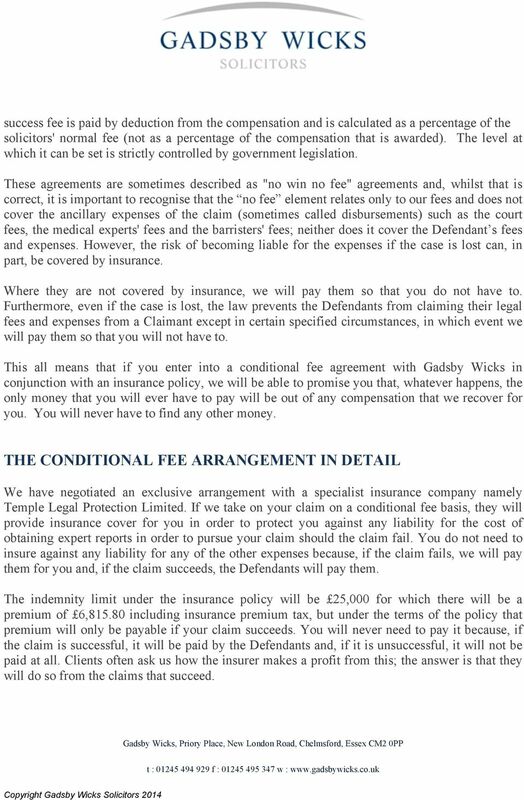 These agreements are sometimes described as "no win no fee" agreements and, whilst that is correct, it is important to recognise that the no fee element relates only to our fees and does not cover the ancillary expenses of the claim (sometimes called disbursements) such as the court fees, the medical experts' fees and the barristers' fees; neither does it cover the Defendant s fees and expenses. However, the risk of becoming liable for the expenses if the case is lost can, in part, be covered by insurance. Where they are not covered by insurance, we will pay them so that you do not have to. Furthermore, even if the case is lost, the law prevents the Defendants from claiming their legal fees and expenses from a Claimant except in certain specified circumstances, in which event we will pay them so that you will not have to. 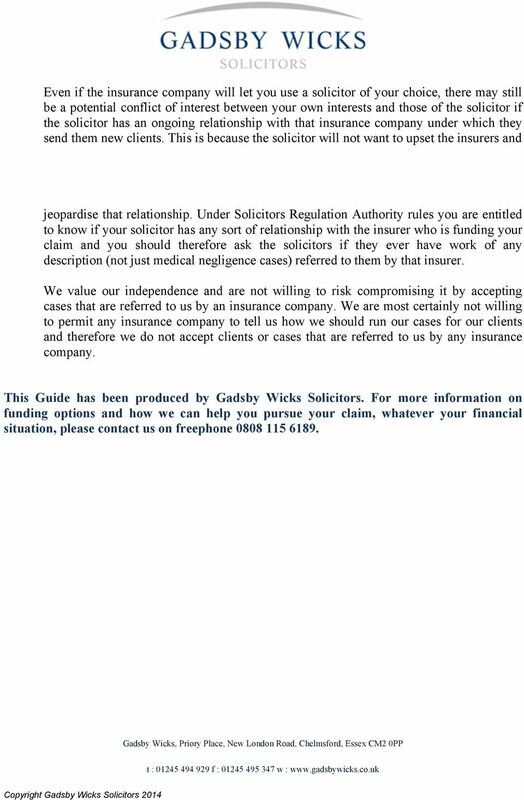 This all means that if you enter into a conditional fee agreement with Gadsby Wicks in conjunction with an insurance policy, we will be able to promise you that, whatever happens, the only money that you will ever have to pay will be out of any compensation that we recover for you. You will never have to find any other money. THE CONDITIONAL FEE ARRANGEMENT IN DETAIL We have negotiated an exclusive arrangement with a specialist insurance company namely Temple Legal Protection Limited. If we take on your claim on a conditional fee basis, they will provide insurance cover for you in order to protect you against any liability for the cost of obtaining expert reports in order to pursue your claim should the claim fail. You do not need to insure against any liability for any of the other expenses because, if the claim fails, we will pay them for you and, if the claim succeeds, the Defendants will pay them. The indemnity limit under the insurance policy will be 25,000 for which there will be a premium of 6, including insurance premium tax, but under the terms of the policy that premium will only be payable if your claim succeeds. You will never need to pay it because, if the claim is successful, it will be paid by the Defendants and, if it is unsuccessful, it will not be paid at all. Clients often ask us how the insurer makes a profit from this; the answer is that they will do so from the claims that succeed. 4 Expenses After we start working with you, we will pay the various expenses that will need to be incurred in order to investigate and pursue the claim. These can be quite considerable amounting to as much as 30,000 (or possibly more) should the claim have to go to a full court trial. We will not require repayment until the conclusion of the claim when, if it is successful, the Defendants will repay us. On the other hand, if the claim is unsuccessful Temple Legal Protection Limited will repay us the cost of obtaining the expert reports and we will waive repayment of the other expenses. Free Initial Investigation If, having completed our initial investigation of your claim we have to advise you that you do not have reasonable grounds for pursuing it through the courts, we will cancel the conditional fee agreement and not charge any fee for the work that we have carried out for you. 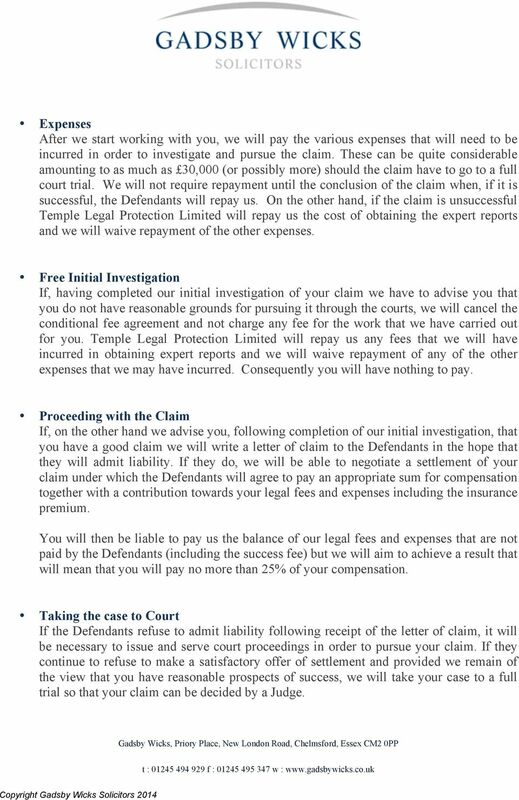 Temple Legal Protection Limited will repay us any fees that we will have incurred in obtaining expert reports and we will waive repayment of any of the other expenses that we may have incurred. Consequently you will have nothing to pay. Proceeding with the Claim If, on the other hand we advise you, following completion of our initial investigation, that you have a good claim we will write a letter of claim to the Defendants in the hope that they will admit liability. If they do, we will be able to negotiate a settlement of your claim under which the Defendants will agree to pay an appropriate sum for compensation together with a contribution towards your legal fees and expenses including the insurance premium. 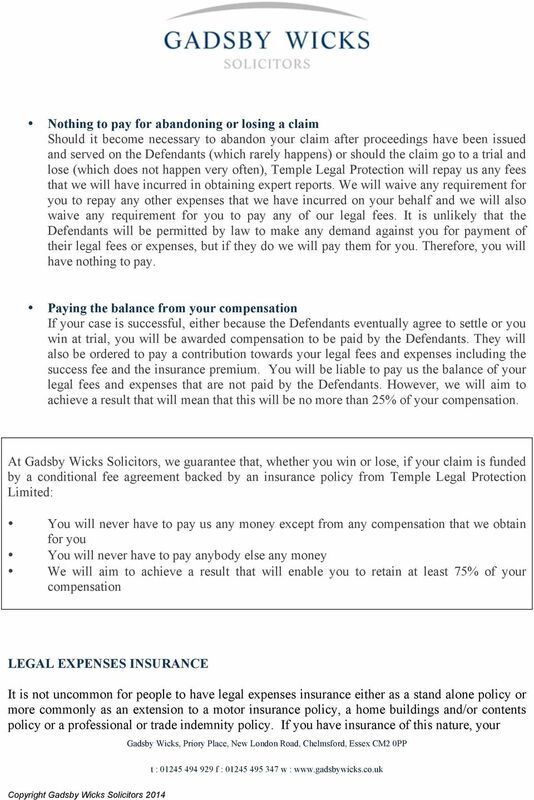 You will then be liable to pay us the balance of our legal fees and expenses that are not paid by the Defendants (including the success fee) but we will aim to achieve a result that will mean that you will pay no more than 25% of your compensation. Taking the case to Court If the Defendants refuse to admit liability following receipt of the letter of claim, it will be necessary to issue and serve court proceedings in order to pursue your claim. If they continue to refuse to make a satisfactory offer of settlement and provided we remain of the view that you have reasonable prospects of success, we will take your case to a full trial so that your claim can be decided by a Judge. 6 legal expenses insurers may agree to meet our fees and expenses and those of the Defendants up to an indemnity limit, which is usually 10,000, 25,000 or 50,000. You should therefore check all of your existing household, buildings, contents, motor and other insurance policies (and those of your immediate family who are living with you) because it often happens that our clients do not realise that they have this insurance cover until we suggest that they check. Please then bring them all to your initial meeting with us so that we can check whether or not any of them include legal expenses insurance cover and, if so, whether that cover will be appropriate and sufficient for your claim. It is important that we make this check for you at the outset because the law does not permit us to apply for legal aid or offer you a conditional fee agreement until we have done so. If you have a legal expenses insurance policy, the insurance company will cover both your own legal costs and those of your opponent. However, there are a number of restrictions and other disadvantages with these policies that you need to be aware of, because they may mean that this will not necessarily be the most appropriate way for you to fund your claim. RESTRICTIONS AND DISADVANTAGES (i) Cover limitations First, whatever form of funding you choose, you need to be sure from the start that you have sufficient funding to take the claim through to a full court hearing if necessary. Sometimes, this can be a problem when relying on legal expenses insurance funding alone because these policies were not designed to fund medical negligence cases. Rather, they are really intended to cover more straightforward personal injury and non-accident claims. Because of this they always have an indemnity limit, which stipulates the maximum sum that the insurers will be willing to pay out under the policy. Although different policies have different indemnity limits, we are not aware of any policy that provides an indemnity limit in excess of 50,000. That is insufficient to take a medical negligence case to a full court hearing because the total of both your own legal costs and those of your opponent if the claim is lost, could easily be 130,000 or even more. Therefore, if a medical negligence claim is pursued relying on legal expenses insurance funding, the solicitor will have to arrange some other form of top up funding in the event that the Defendants resist the claim and it becomes necessary to take it to a court hearing. 7 The problem with this is that it may not then be possible to arrange alternative funding at that late stage. For example, even if the solicitor is willing to switch to a conditional fee arrangement (and not all solicitors will be willing to do so) there is no certainty that an insurance company will be willing to support it with insurance cover. This is not a theoretical possibility but something that actually happens. 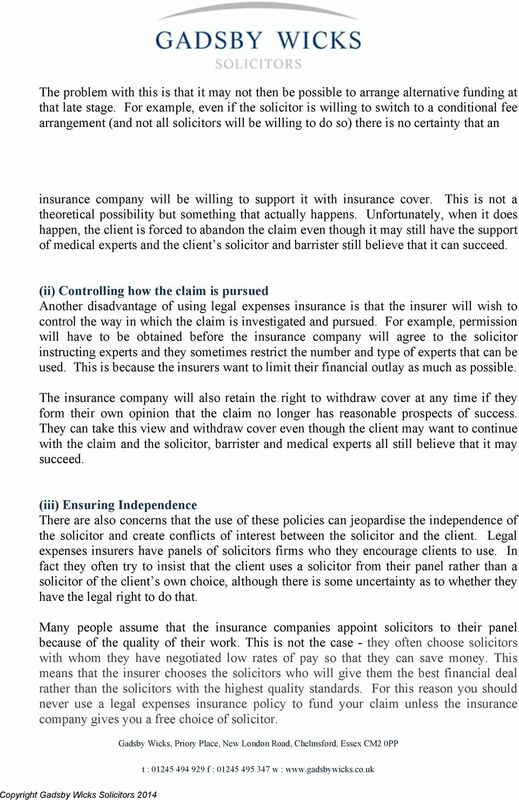 Unfortunately, when it does happen, the client is forced to abandon the claim even though it may still have the support of medical experts and the client s solicitor and barrister still believe that it can succeed. (ii) Controlling how the claim is pursued Another disadvantage of using legal expenses insurance is that the insurer will wish to control the way in which the claim is investigated and pursued. For example, permission will have to be obtained before the insurance company will agree to the solicitor instructing experts and they sometimes restrict the number and type of experts that can be used. This is because the insurers want to limit their financial outlay as much as possible. The insurance company will also retain the right to withdraw cover at any time if they form their own opinion that the claim no longer has reasonable prospects of success. They can take this view and withdraw cover even though the client may want to continue with the claim and the solicitor, barrister and medical experts all still believe that it may succeed. (iii) Ensuring Independence There are also concerns that the use of these policies can jeopardise the independence of the solicitor and create conflicts of interest between the solicitor and the client. Legal expenses insurers have panels of solicitors firms who they encourage clients to use. In fact they often try to insist that the client uses a solicitor from their panel rather than a solicitor of the client s own choice, although there is some uncertainty as to whether they have the legal right to do that. Many people assume that the insurance companies appoint solicitors to their panel because of the quality of their work. This is not the case - they often choose solicitors with whom they have negotiated low rates of pay so that they can save money. This means that the insurer chooses the solicitors who will give them the best financial deal rather than the solicitors with the highest quality standards. For this reason you should never use a legal expenses insurance policy to fund your claim unless the insurance company gives you a free choice of solicitor. Holiday Illness Personal Legal Services This information relates to the law and procedures in England and Wales. Please contact us if you need advice about the law and procedure in other legal jurisdictions.